The Dutch green party Groen Links won the elections in Amsterdam and that means they will try to make Amsterdam a greener place. Here are a selection of 6 things they annouced that should Amsterdam make a better place to visit, live and work. Let me know in the comments what you think about these changes! Lots of boats with party people and loud music cruising the Amsterdam canals on, it’s fun for them, but a nuisance to the people who live there. That is why in 2019 it is not allowed to cruise the Amsterdam canals in the night any longer, And you need a license to take more than 12 people on your boat. Amsterdam Noord is a great area to go out, bike around and even live. That means more and more people are crossing the IJ water. 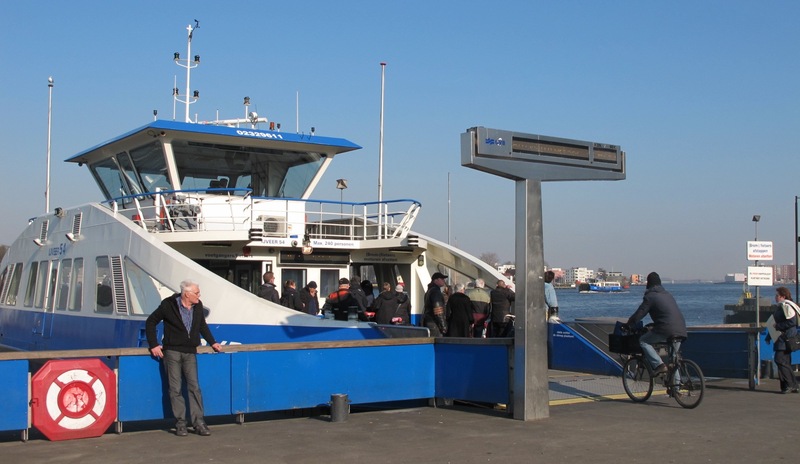 Even though the new metro to Amsterdam Noord is now runnning, the ferries remain the most popular mode of public transport in Amsterdam to cross the water behind Central Station. The ferry’s to Amsterdam Noord get about 80.000 people across the IJ every day! In busy hours and days when there are festivals at NDSM that means long waiting lines.The Amsterdam council has announced measures to combat the issues. In 2019 there will be an extra ferry at work. Also the chaotic waiting area on the docks behind Central Station gets a rehab. 3. Finally! Scooters with helmet to the bike path! To the relieve of many Amsterdam cyclists, it’s finally gonna happen: scooters off the Amsterdam bike paths! It was already announced last year that Amsterdam wanted the scooters off the bike line. From 8 April 2019 scooters and motor cycles that go max. 45 km per hour cannot ride on the bike lane any longer. They must share the normal road with the cars. It will be more dangerous for scooters, so people who ride one, must wear a helmet. Not surprisingly, the greens are raising the parking tariffs in Amsterdam in 2019. An hour parking your car in Amsterdam will cost €7,50 instead of the current €5 per hour. The new parking tariffs in Amsterdam will start in March 2019. The Amsterdam council is also taking parked cars off the streets. It wants to cut down on the amount of parking spaces. Already the removal of 7.000 to 10.000 parking spaces is underway. Many people in Amsterdam blame Airbnb for the troubles caused by the huge amount of tourists in Amsterdam and so the fight against the vacation rental service continues in 2019. From 1 January 2019, Amsterdam residents can rent their homes to tourists only 30 days per year. (It used to be 60 days). Airbnb is big in Amsterdam. 22.000 homes are rented to holiday makers for short stay every year. The tourist taxes are rising in 2019 in Amsterdam. In 2018 tourists paid 6% in taxes to the council via their hotel bill. That will be 7% in 2019.